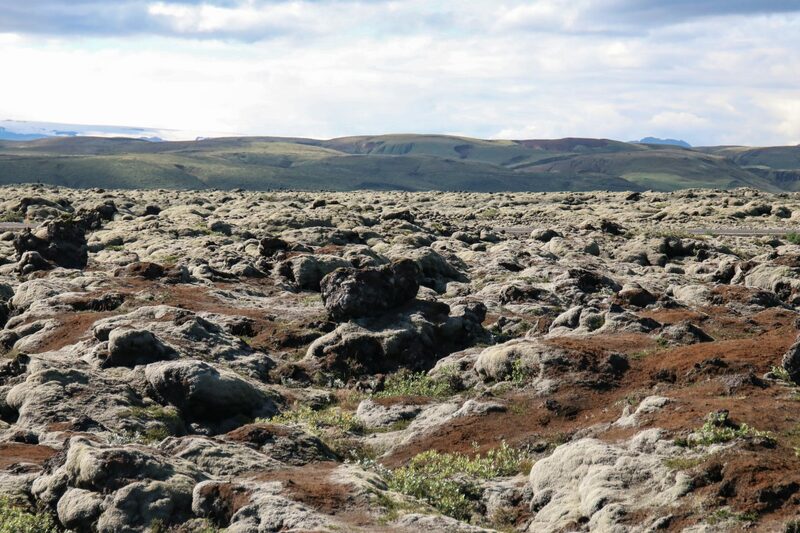 Iceland – the land of fire and ice. For ages I’ve been dreaming to travel this wild and feral country. 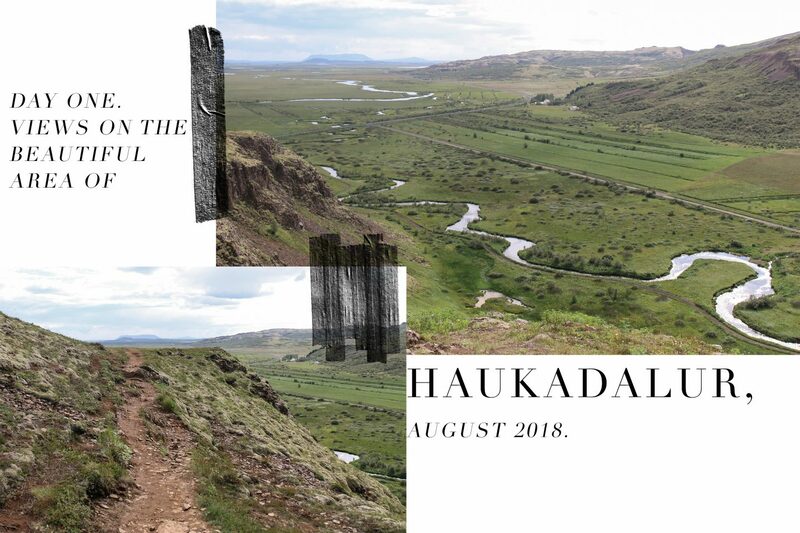 I wanted to see the rough nature with my own eyes – and in August 2018 I finally did. 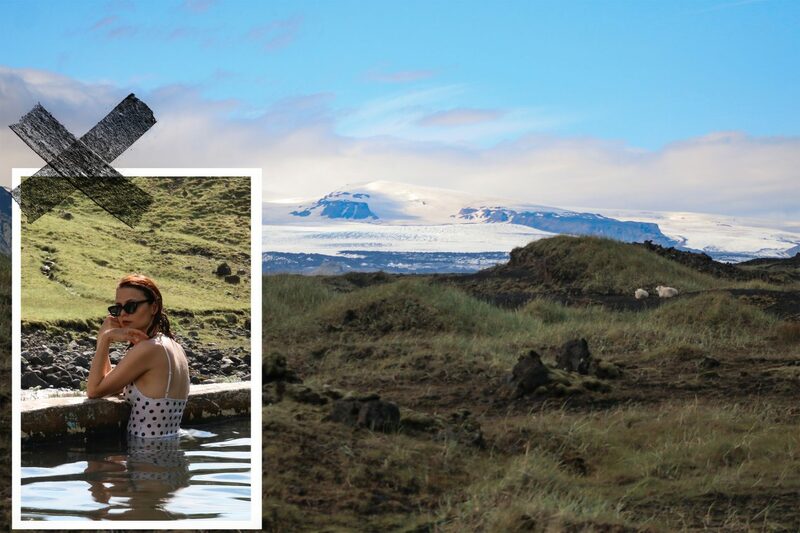 So if you are currently planning your trips and vacations for 2019 or are an Iceland lover just like me, than this post is for you. If you are more into videos than reading, just watch the video below so you can get a few impressions from our trip. During a lifetime you see lots of different places and you gather so many experiences that it’s sometimes hard to tell which one shaped you the most. But what I can say for sure is that Iceland was maybe one of the most intense and special experiences that I’ve ever had. After we’d landed in Reykjavik and slept one night in the northernmost capital city of the world, we picked up our car and started driving. Our goal: to close the loop and drive the whole ring road within one week. The ring road or route number one tracks in a circle around Iceland. Most people which do a road trip choose this route as you automatically drive by so many beautiful sights and districts without having to make any big circuits. We are sitting in our car. It’s a bit of a disappointment, to be honest. I paid more than 1k to sit in a tin box in which we are going to spend day and night for the next week. We are equipped with a mattress, a thin blanket, two pillows by Ikea and the necessary cooking utensils. Every time we are cornering the whole car rattles, it’s a super old boxy van. My boyfriend says that the gear box doesn’t seem to work all properly but hey: never mind. We are on an adventure, it’s day one on the road and we are excited as hell! First mission: finding a supermarket. All the online forums tell you that supermarkets are rare as soon as you leave the bigger cities. So food is priority number one. As soon as I don’t have anything to eat, I get hangry. Just a kilometer away from the car pick-up we find a supermarket and gladly, it’s a good one! There are four big supermarket chains in Iceland: Bónus, Krónan, Nettó and 10-11. First lesson for all you Iceland newbies (just like we were): the first three are safe (although there are also big differences in the price and products range) but 10-11 is the danger zone. If you are living on a budget during holidays (for example if you already paid hella lot money on other things) I recommend you to not even enter the 10-11. After we bought some stuff at the Krónan supermarket (which is the cheapest of them all, although cheap in Iceland means expensive in Germany) to survive at least the next few days we are finally leaving Reykjavik behind. For a while we are driving on the freeway but soon it changes to a “normal” Icelandic road: two tracks, one for each direction. 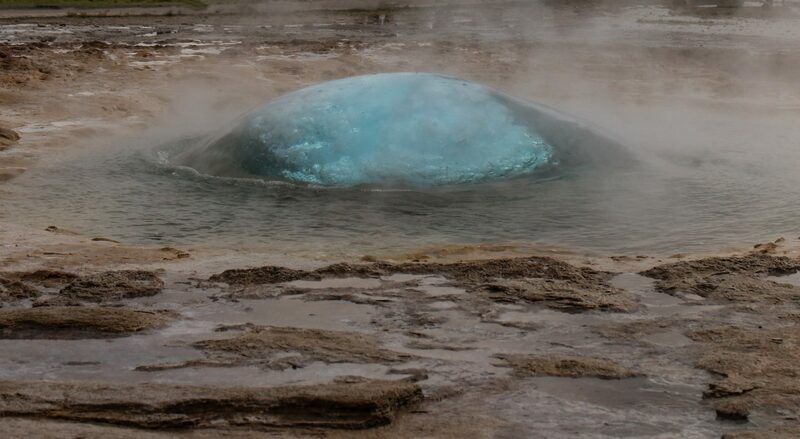 Our first planned stop is part of the Golden Circle (the most touristic trip for Iceland visitors): the Big Geyser and some hot springs in the Haukadalur area. While we are on the road to this place I can’t stop staring out the window and admire this majestic nature. The colors and shapes of this country are really insane! EVERY piece of land is worth a photo (4.500 photos in one week excluding outfit photos – what more can I say?). 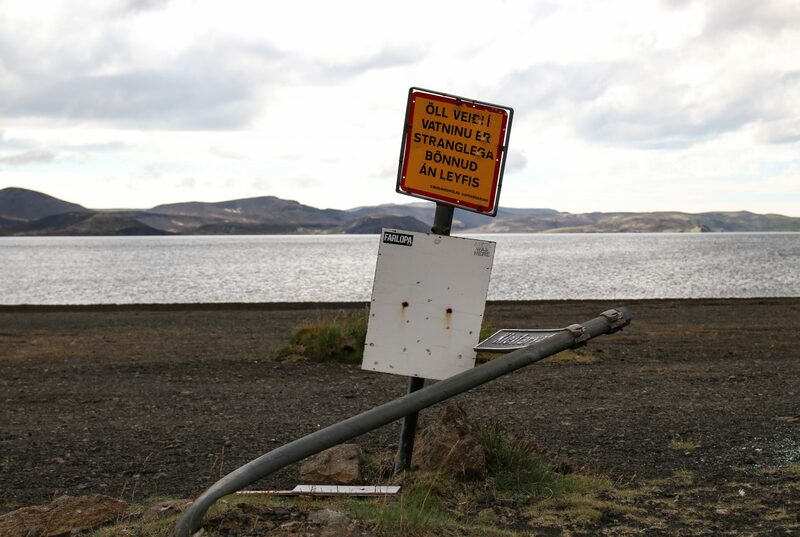 While staring out of the window I’m also noticing a road sign indicating a new sight: Kerið. Spontaneously we are heading for the parking lot. 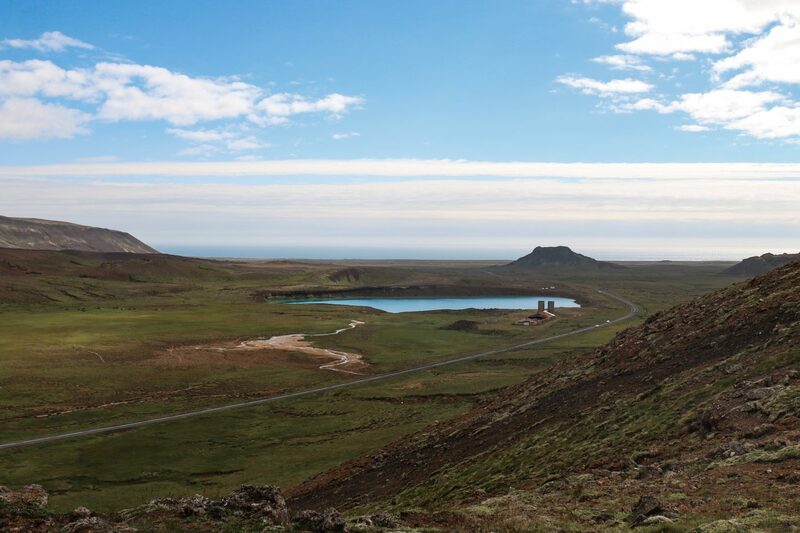 I’ve seen images of Kerið before online but didn’t realize that we are going to drive by it. 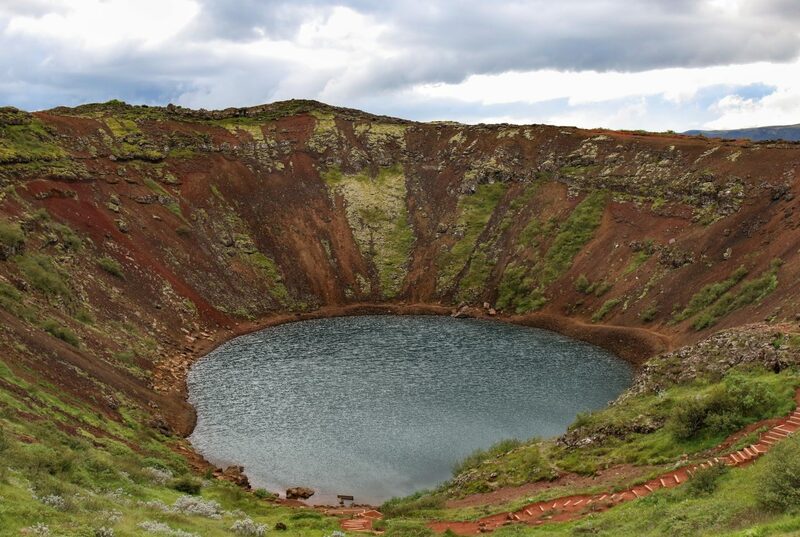 Scientists think that Kerið was a cone volcano which erupted and then emptied its magma chamber. After that, the cone collapsed into the empty chamber. The lake which is now visible isn’t caused by rainfall, instead it indicates the ground-water table. A fifteen minutes drive later, another parking lot. So many cars are parked here, so many people strolling around. 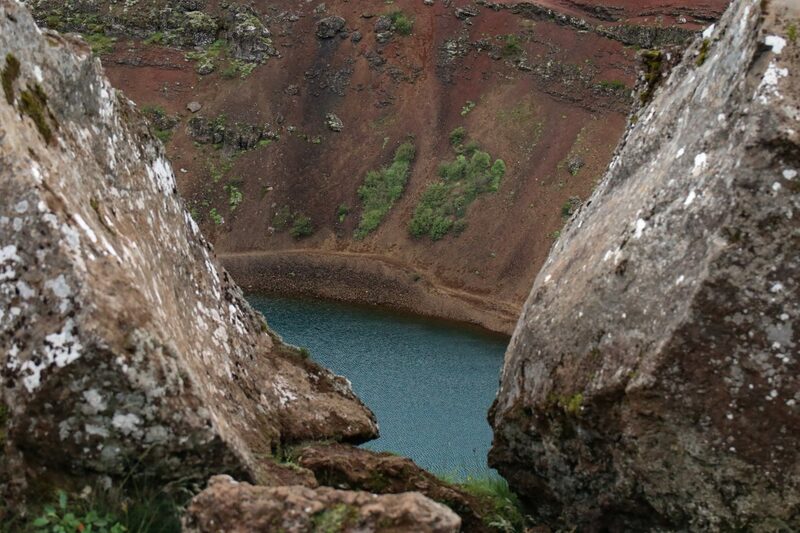 Seems like Kerið was empty in comparison with this place. We are leaving the car and after a few minutes already seeing steam above the ground. The floor really seems to be a lot warmer here, I even have to open my jacket. People are holding their fingers in little streams, although a sign tells them not to do so: the temperatures go up to 125 °C degrees (257 °F). I’m one of them, I can’t resist the temptation to experience geothermic first handed: the water is warm, but it’s not hot (lucky me! 😉 ). Even though I definitely wouldn’t hold my hand in all of those streams and springs – when there’s steam, it also has to mean that the water and ground are over 100 °C degrees, right? I’m impressed how this whole place looks: just like fog, steam is covering parts of the landscape. While I’m acknowledging the beauty of mother nature I hear yelling in the distance: seems like the Big Geyser has erupted. I’m curious about seeing this with my own eyes. 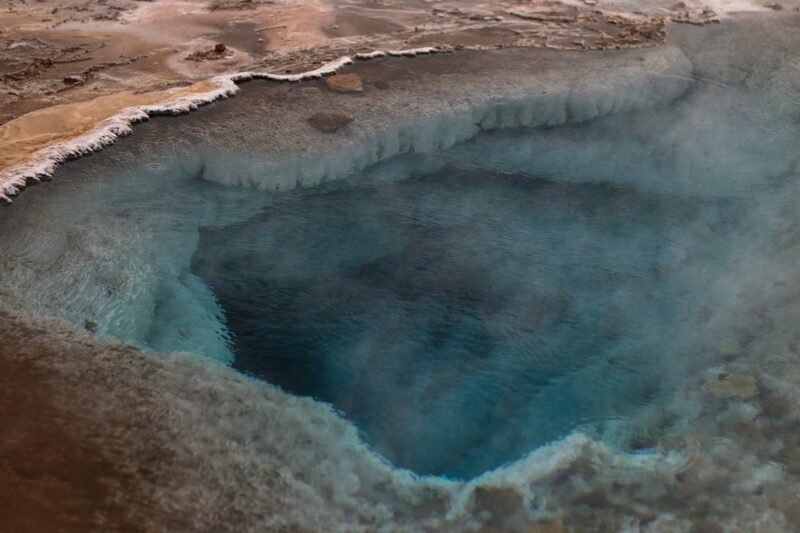 The Big Geyser erupts about every 6 minutes and it’s really a spectacle: the water surface stretches itself to a globe, erupts afterwards while throwing water particles high up in the air and in the end they rewind, falling back in the hole until the pressure is high enough and it starts again. After a long stroll to the sea, we were finally back into the car. Another day, another aim. We are still chilled to the bones from that long cold night, as we reach one of our destinations for that day – Seljavallalaug. Behind the strange name conceals the most beautiful public swimming pool I’ve ever been to. 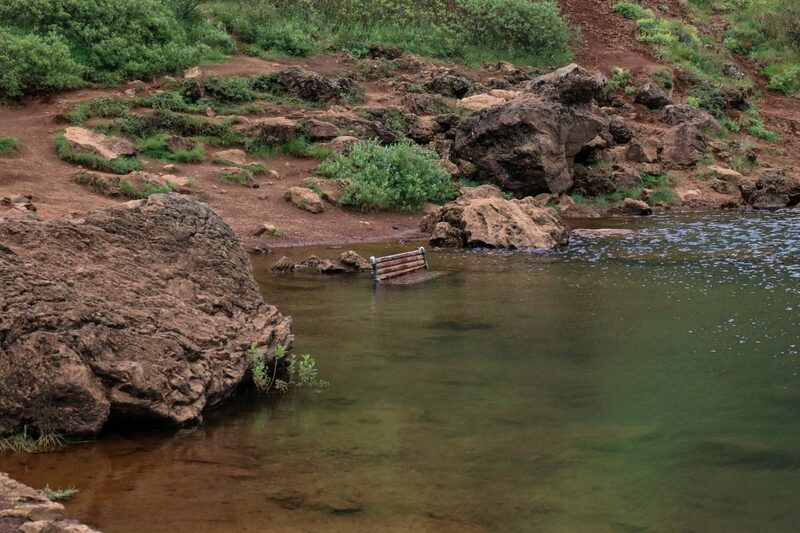 The pool was built in a cliff and is fed by natural hot springs which have its source high up in the mountains. 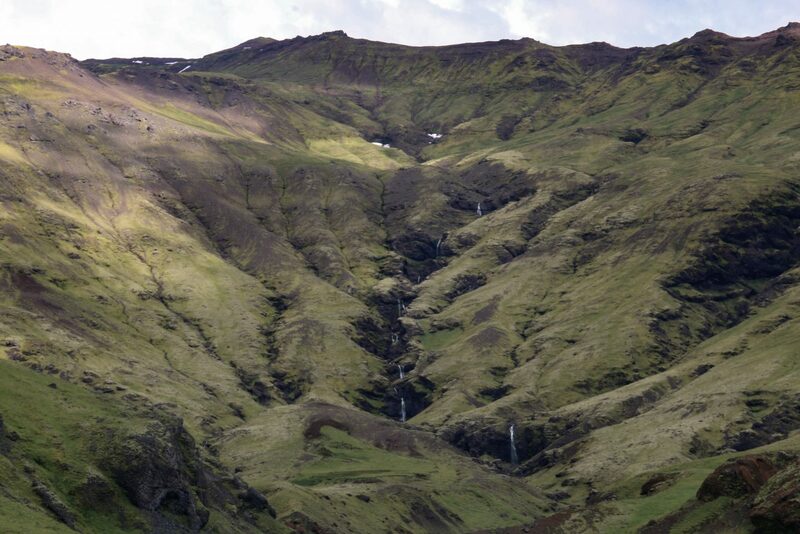 The view is breathtakingly beautiful: green mountains, a river course below, sheeps here and there and not to mention the insane cascades which made their way from the top of the mountain in eight steps to the valley (see image above). I enjoy the sun, the hot water bubbling against my back and the little exercise. If you ever come to Iceland please do yourself a favor and visit that place! 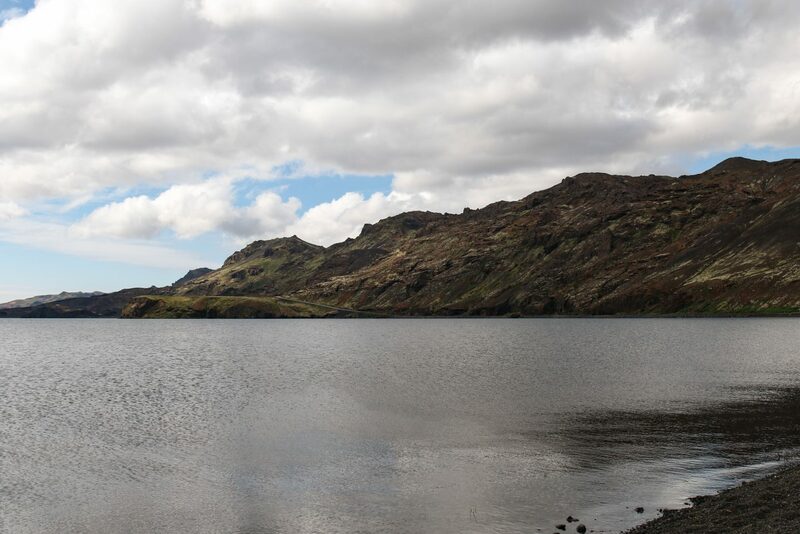 I know the Blue Lagoon also looks incredible, but if you are looking for a free and less touristic hot pool in Iceland, I recommend you to go there. In retrospect I think, that maybe our stay in the pool is the most beautiful memory of our vacation. We stayed for hours in the pool but there’s a saying in Germany that you should leave when a situation is the most beautiful, so it was about time to move on. 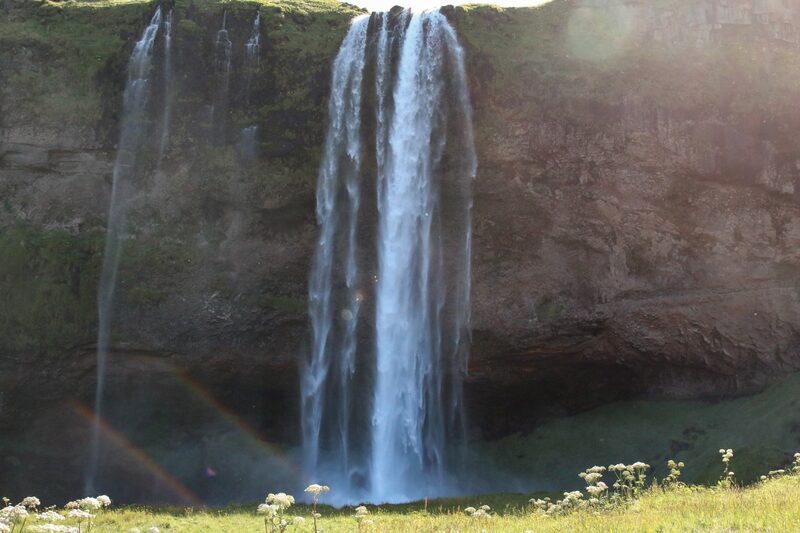 The next planned stop on the list was Seljandsfoss. 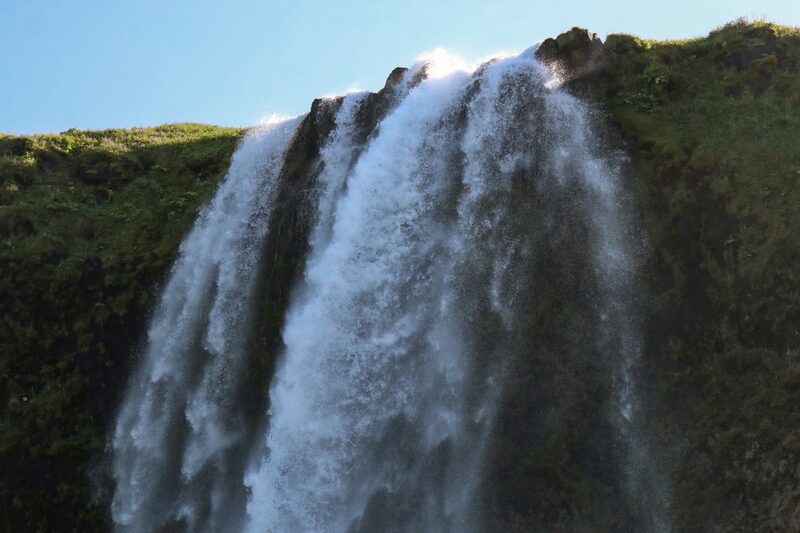 Foss is the Icelandic word for waterfall and there are so many “fosses” in Iceland that you could plan a whole trip around seeing these beautiful nature spectacles. 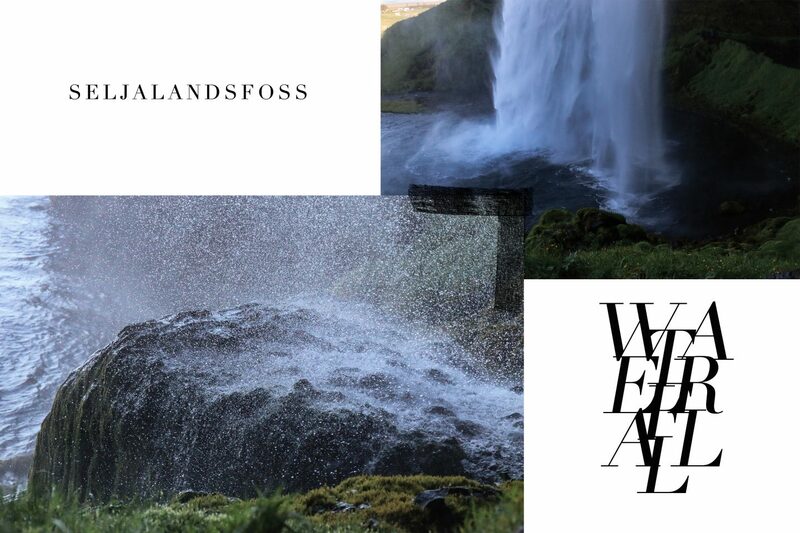 Nonetheless, there are two points which set apart the Seljandfoss from others. 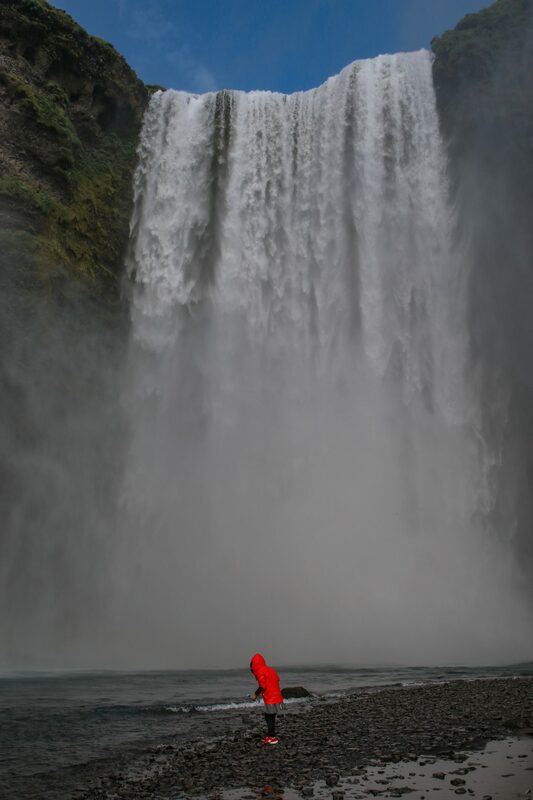 The first thing is that you can walk behind the waterfall, which allows you to enjoy a 360° view upon its beauty. 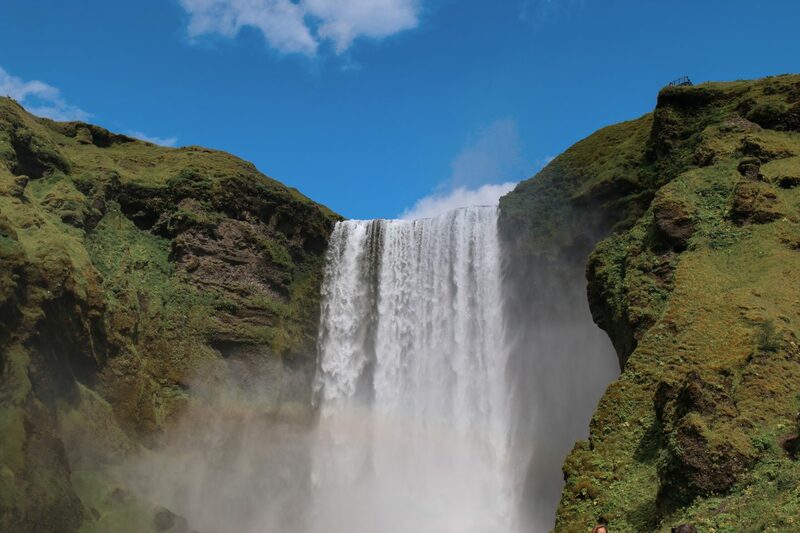 In the second place to be considered are the rainbows, which get visible when sunlight meets the dropping water particles. Apropos: the caused spray, which accrues when water and heights clash, is really impressive. In other words: while we are walking behind the waterfall my boyfriend and me both get super wet. So don’t forget to bring your raincoat with you, even when the sun is shining! 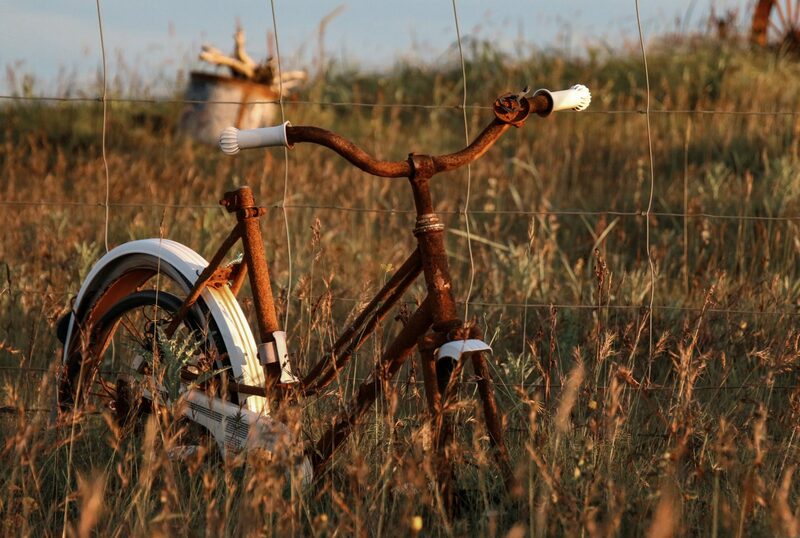 I’m always drawn to things that where left behind by humans. Places, that once were full of life and are now forgotten. Seeing how such develop and evolve, how mother nature re-conquests human produces is so fascinating to see. 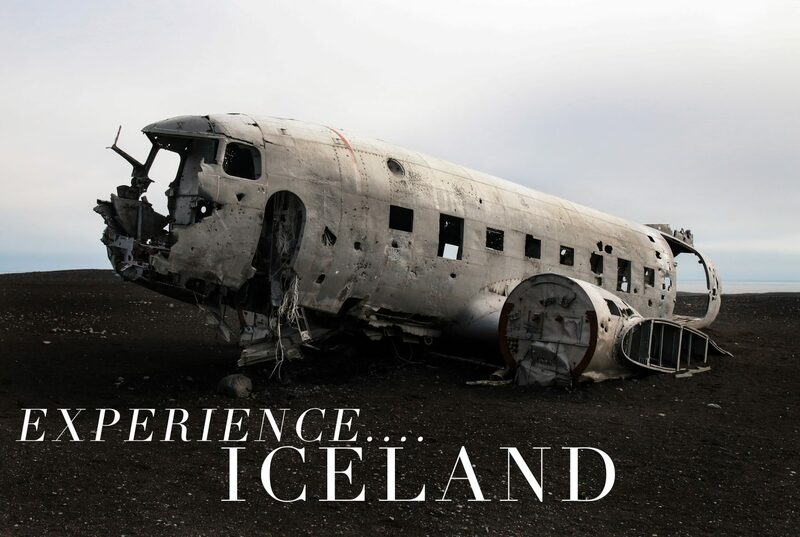 So travelling to Iceland without visiting the famous Sólheimasandur plane wreck would have been impossible to me. 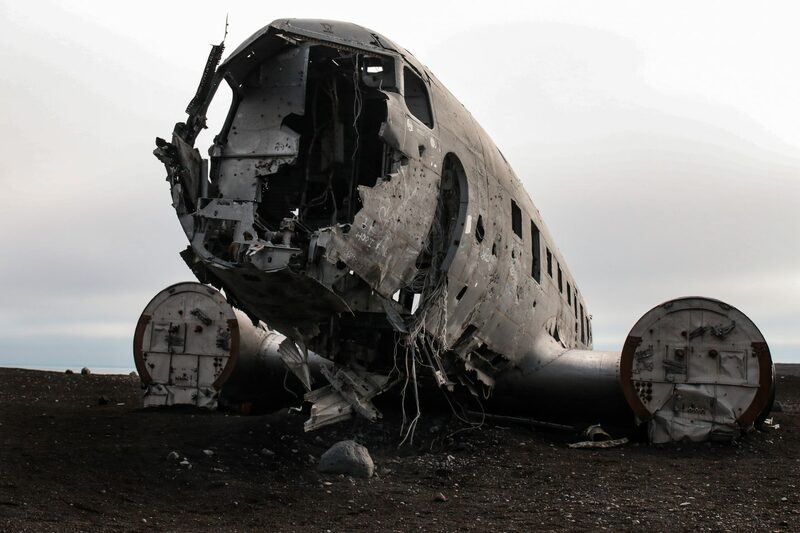 On the 21st of November 1973 the aircraft Douglas C-117 had to make an emergency landing in Iceland. None of the passengers were hurt during this process, although the ship itself doesn’t look as airworthy anymore. Since that very day, the C-117 stayed on the black beach, surrounded by nothing but black stones in a radius of square kilometers (you can see more in this post). We’ve been walking for about 45 minutes in a very fast pace to get to the wreck. It’s about 4 kilometers away from a parking lot. The way there isn’t complicated, as it’s marked by yellow signposts but it’s not recommended to go there during bad weather conditions, as the never-ending stone wasteland might be confusing and the wind and rain, which can make their way unhindered through the plain land might get dangerous for your life and safety. Another cold night during our stay. We slept in the tiny town Vík í Myrdal close to the Black Beach. Right after we made ourselves a nice breakfast, we walk towards the sea. 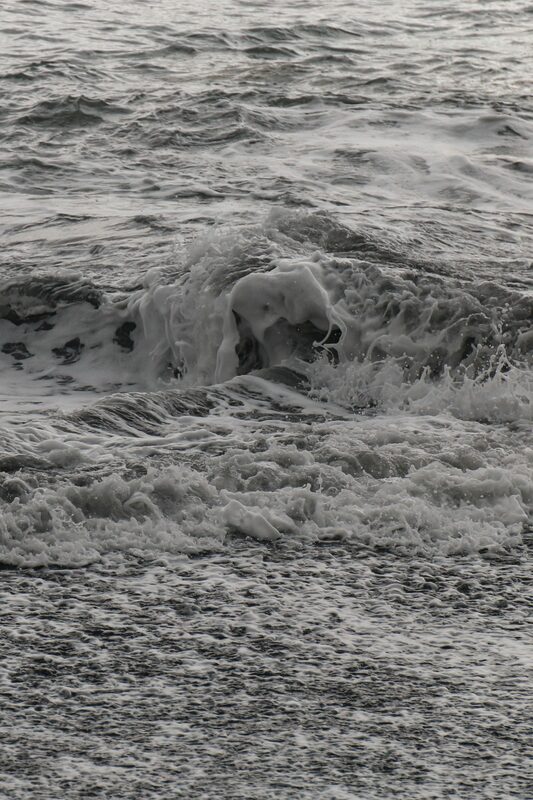 I think everyone who’s been to a volcanic beach will understand how impressed I feel in this very moment: whitecaps meet the black shore. 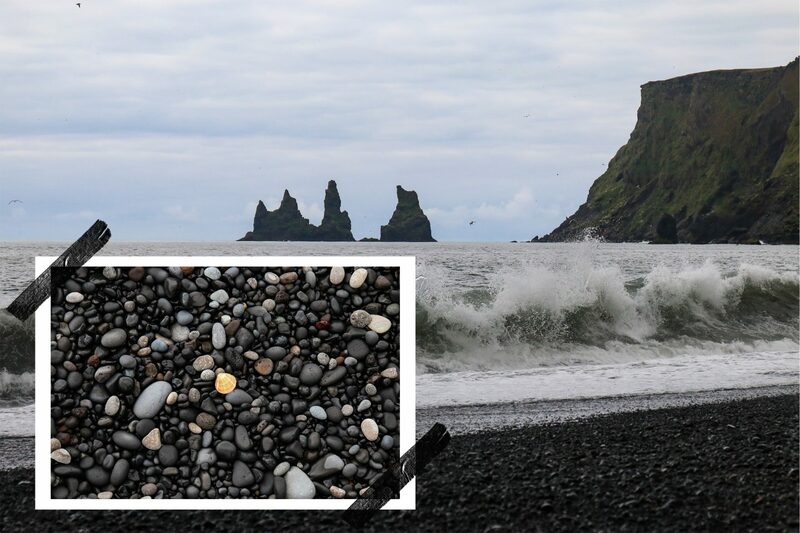 Not only the gravel stones close to the beach are black, but also the sand itself is black. It looks like Photoshop in real life, like you would apply a black and white filter upon reality – just unreal. 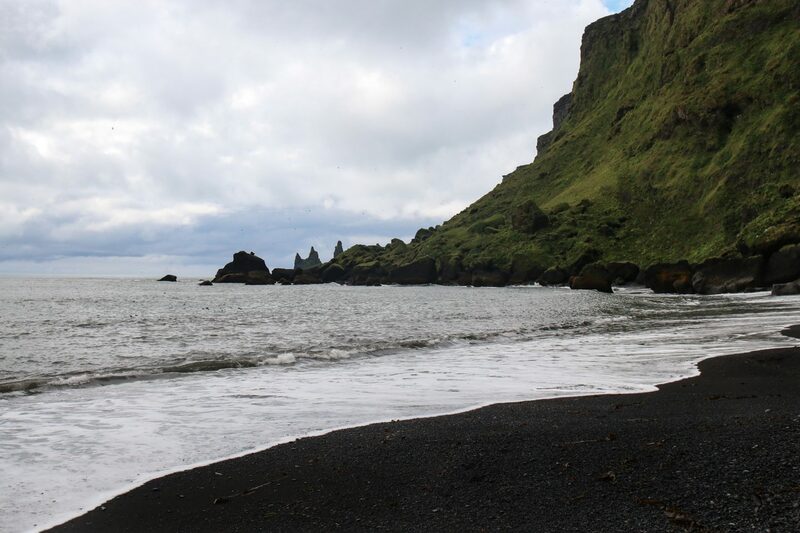 My feet sink into the black sand, the Atlantic is so loud and the wind so cold, but it simply makes this place even more special. In the distance we can see some cliffs tower over the water. 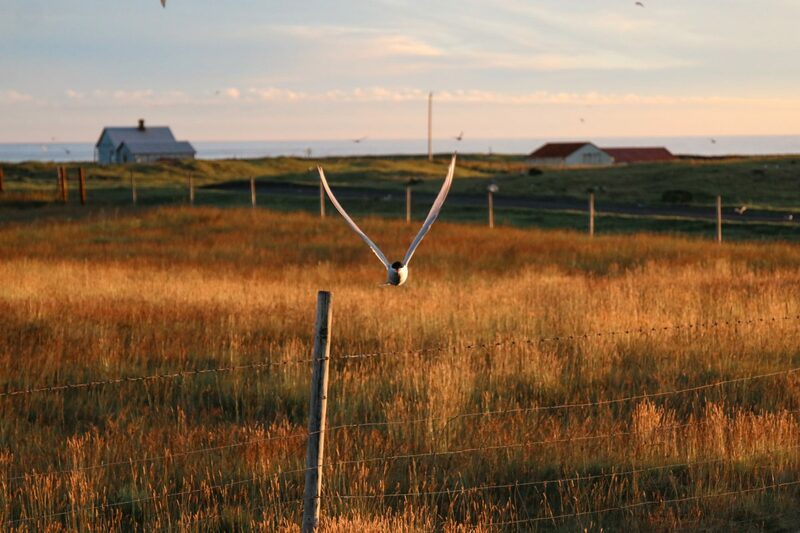 Many seagulls, but also puffins (the national animal of Iceland) breed and live here. Although I’m not much into souvenirs, I really like to collect shells. The beach is full of beautiful round gravels, interesting stones and lots of little white fragile mussels, but nothing to take home. Kai is walking a bit in front of me, picks something up from the dark ground and with excitement in his voice calls my name: he found a perfect orange shell. I’m really happy to take that beauty home! On the way back to the car, we meet a group of equestrians. What a beautiful place to sit on the back of a horse, but the trips are very expensive (100 € per person / 40 minutes). It’s about time to pick up some errands again and luckily, Vík has a Krónan supermarket. Located right next to it is a shop called Icewear. If you ever come to Iceland you’ll see these Icewear shops every now and then, especially in more touristic areas. Just keep this shop in mind, I’m going to come back to it later again (literally!) 😉 . 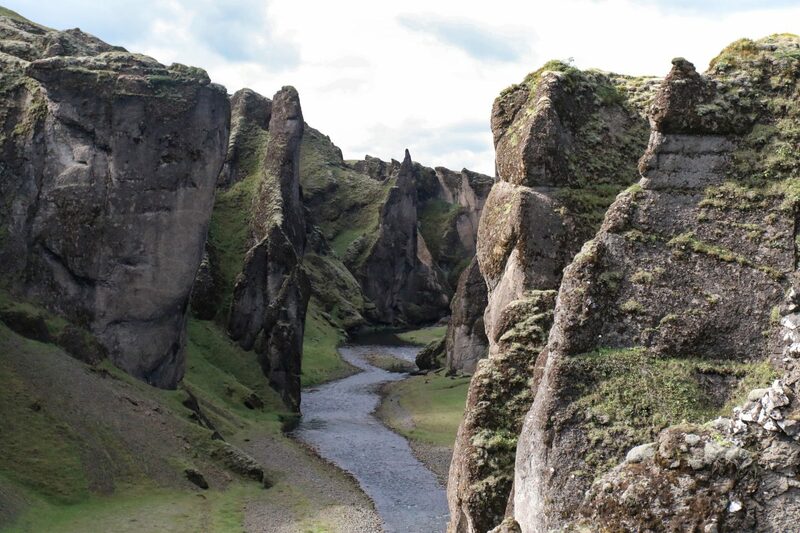 We are back in the car and on our way for something really exciting: the Fjaðrárgljúfur canyon. I heard that it should be an insane place and a breathtaking view. While we are in the car I notice that we are driving by the Elduran moss field. 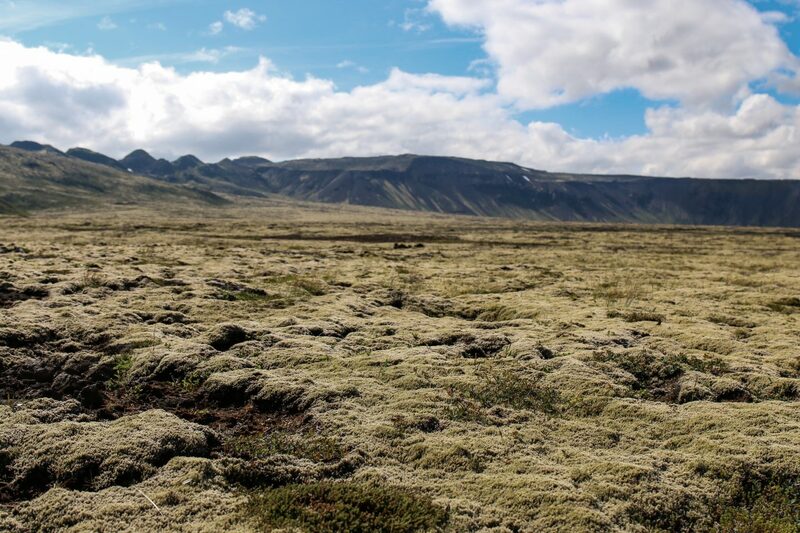 You’re going to see a lot of moss in Iceland. 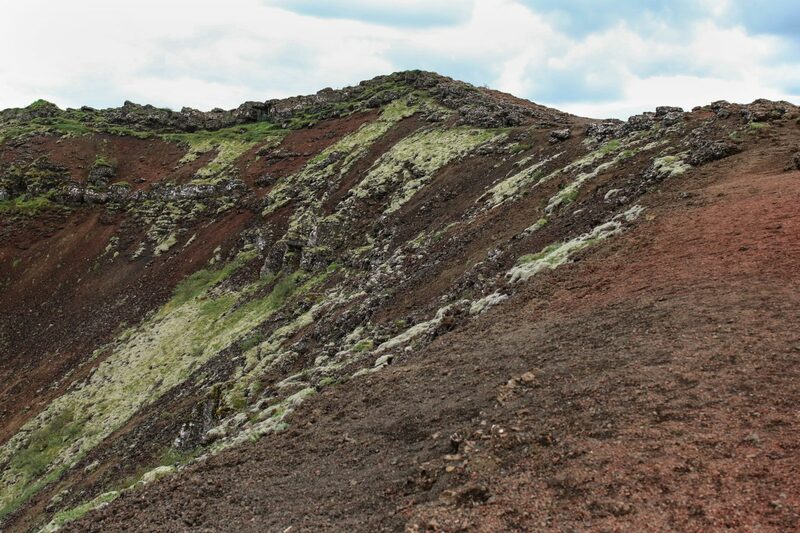 The circumstances for moss to grow are perfect in Iceland because of the volcanic soil and wet air. It’s so special that it’s even protected by the law. 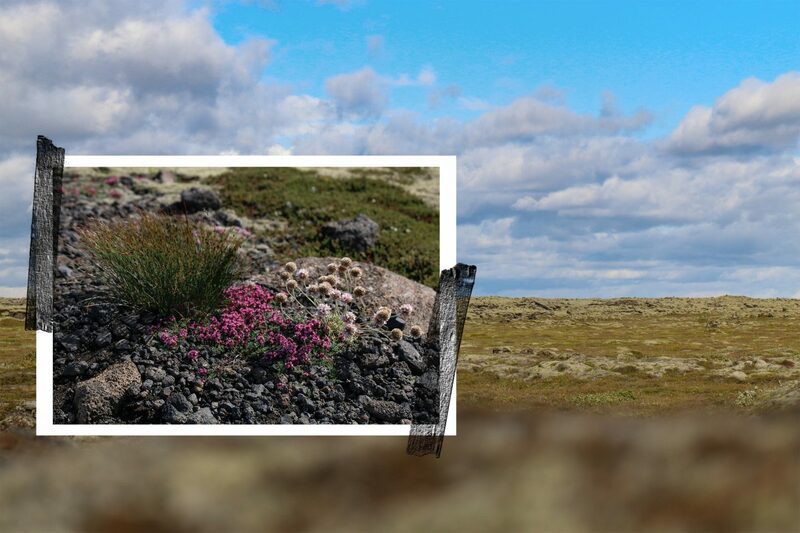 Moss takes like forever to grow, which is the reason why the Icelandic people care so much about it. The next parking lot is on our side, so we decide to leave the car for a little stroll (and also photo-shooting) through this insane landscape. After a while, we drive on with our true destination in focus. A short drive later and we leave the two-track road, turn off and reach a cobble road. 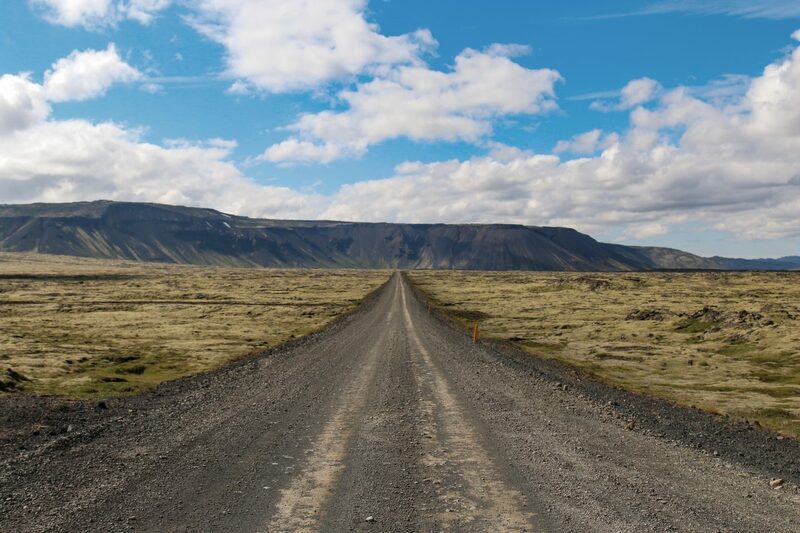 Gravel roads are quite common in Iceland and there are many of these which you can also drive if you don’t have a 4×4 engine: You just have to drive as slow as you possibly can so you won’t damage the car. There are many road signs which tell you about how to drive (or how not to drive 😉 ) during the different and also quite difficult driving conditions. We made jokes so often, that those roads should be renamed in bumpy instead of gravel roads, because you jump up and done so often in your seat, if you don’t have an off-road vehicle. 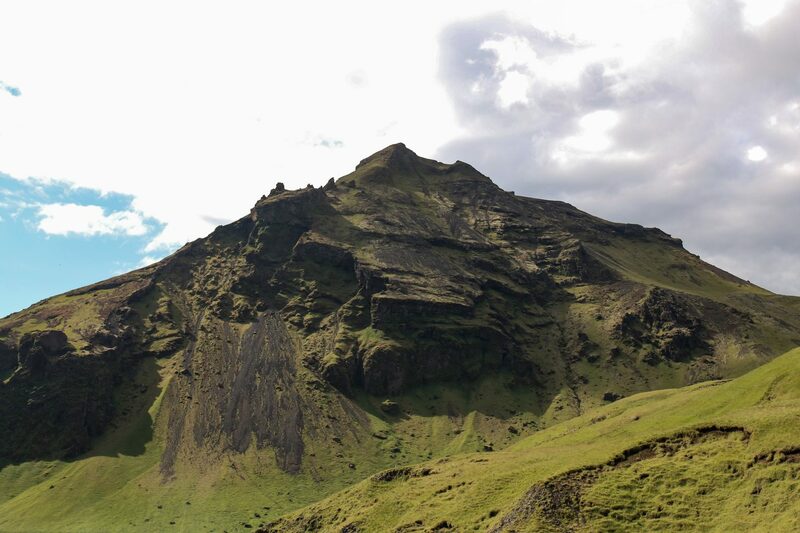 What divides the road to Fjaðrárgljúfur from many others is the fact that the course of the road is hidden most of the times and you only have one track. I feel quite anxious (I’m a coward so often!) as we enter the road, because it starts straightaway with a dangerous hill, but luckily nothing happens to us. After a few minutes we reach our final destination. An exhausting walk later we can finally enjoy the full view upon the wonderful canyon: the cliff itself looks totally unbelievable, but also the magnificent view over the plains of Iceland, including Elduran is impossible to describe. 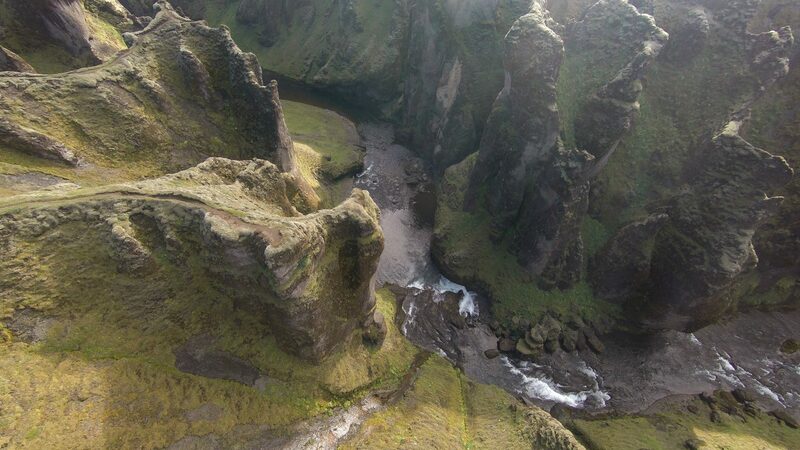 Here we also start the drone for the first time during our time in Iceland (sadly, I didn’t set the resolution to maximum (ouch!)). Whatever. 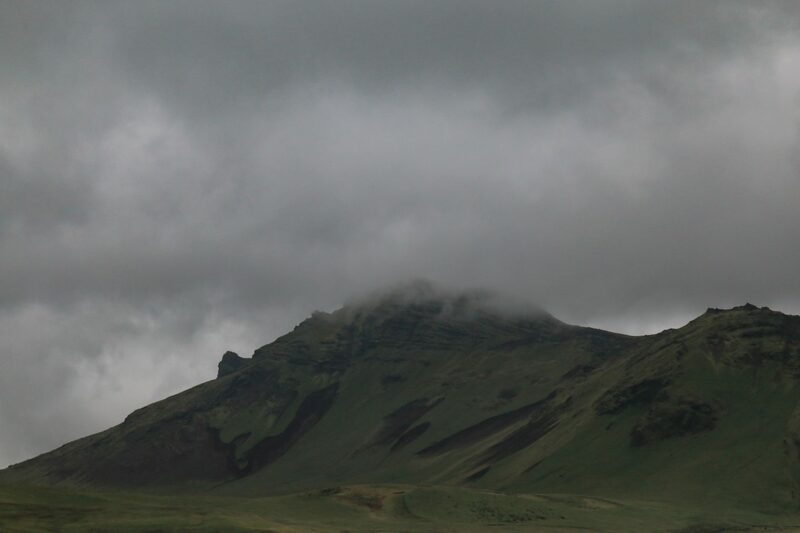 The photo above is my favorite of all the wonderful Iceland shots and I’m also thinking about printing it for our home. I don’t know what makes it so special for me. Maybe it is because I had shaky legs, when I pressed the trigger, as I’m afraid of heights and we were standing on a rusty lattice platform, which was free floating over the river. Or it was simply the overwhelming beauty of this moment, the breathtaking view and that I could experience this moment with my beloved boyfriend. I’ll never know, but I simply love this picture (no self-praise here!). Oh, that fourth day – it should change our trip into a whole new direction, but we didn’t know about it when we woke up on the tiniest campsite, all covered up in clothing and every other piece of textile we could find. It was a sunny day, some crazy people were running around in their shorts (what’s up with these people? Like seriously?!) and we were exploring a waterfall right behind the campsite, while making some drone videos (still not set on max). 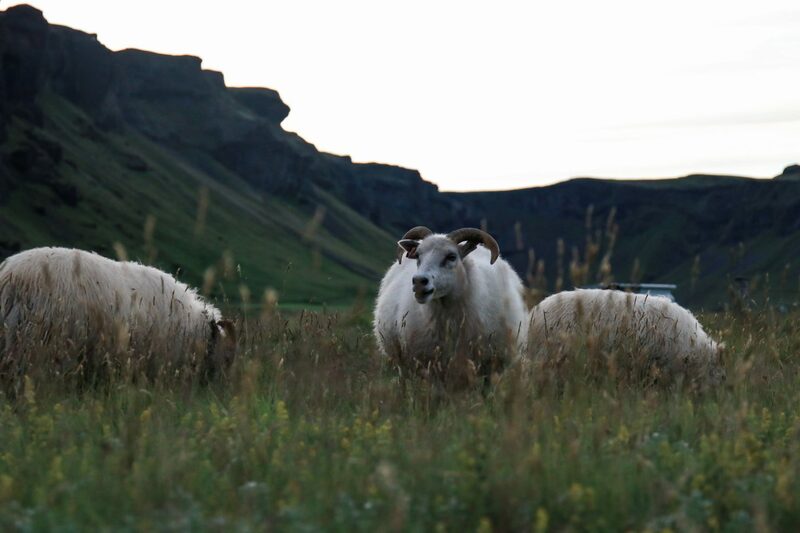 At least I was lucky enough to sneak towards those cute little sheep and try to do some proper shots. Did you know that there is also a road sign for areas which are dominated by sheep? 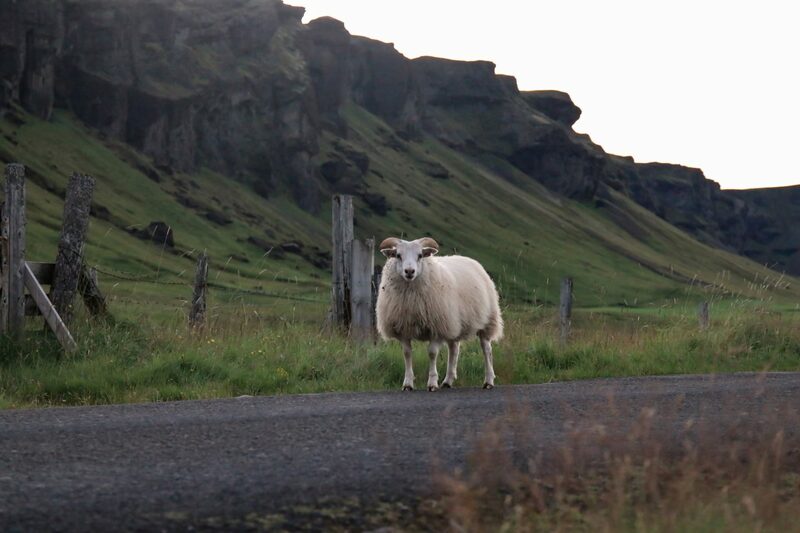 For example: We drove along a road until the sign appeared that for the next 12 kilometers it’s going to be sheep territory – and actually, there were a lot of sheep crossing roads and walking along the roadway in that area. But back to my main topic. 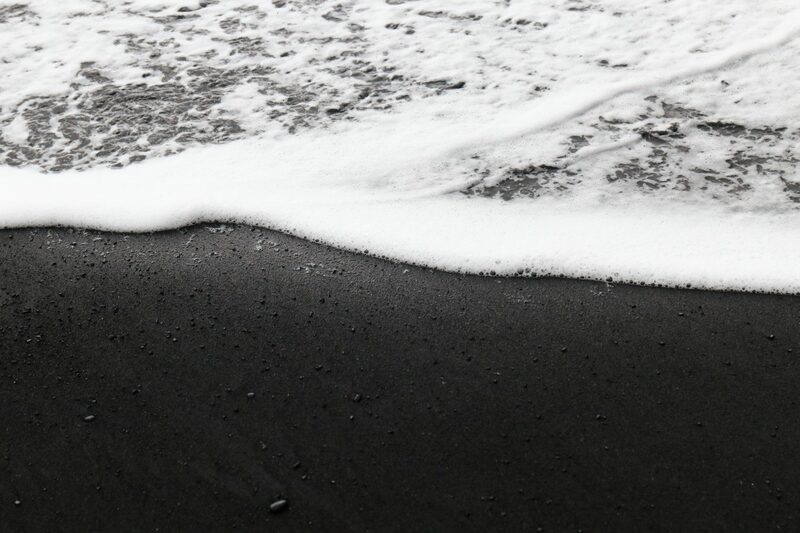 Our plan for that day was to visit the glacial lake Jökulsárlón, where black sand and ice meet. I think this has to be one of the most beautiful, but also saddest places on earth, as the beauty of this lake is about to vanish with the climate change and melting icebergs. So we are sitting in the car and I’m searching for the way to Jökulsárlón on Google Maps, as a push notification grabs my attention. Shortly after the first one, I get another E-Mail and I’m curious what could be as urgent. One mail is by the car hire, the other one from the civil protection department of Iceland: the glacier Vatnajökull is about to calve. It is not recommended to drive any further in this direction, as the water surface will rise, so streets and bridges might be flood or covered in mud. I’m sad, that we can’t drive any further on our planned route and that I’m not going to be able to see the glacial sea but on the other hand I couldn’t be more grateful, that I received these messages – who knows what would’ve happened to us if we just drove further? So here we are, sitting in the car, all our plans have been upset and we have no idea what to do. The predictions of the weather and civil protection page both say, that the consequences of that glacial event will take about four days. No chance to drive on, no chance to close the ring road. It’s impossible to go around on any other roads in Iceland as it nearly just consists of the ring road. The heartland isn’t reachable with a normal car due to the mountains (upland). Now, we feel trapped. The only movement is backwards. I have mixed feelings while we are driving into the direction we came from. I am sad and thankful at the same time, but also feel quite lost. Apart from this Kai got sick last night. He caught a cold, so we are driving very slow and careful. I feel so sorry for him as I don’t have a driver’s licence, so I can’t relieve or change seats with him. These events were a big down during our trip and also a huge challenge to keep us two motivated. We decide, that it would be the best to check out some other sights we skipped during the way there. 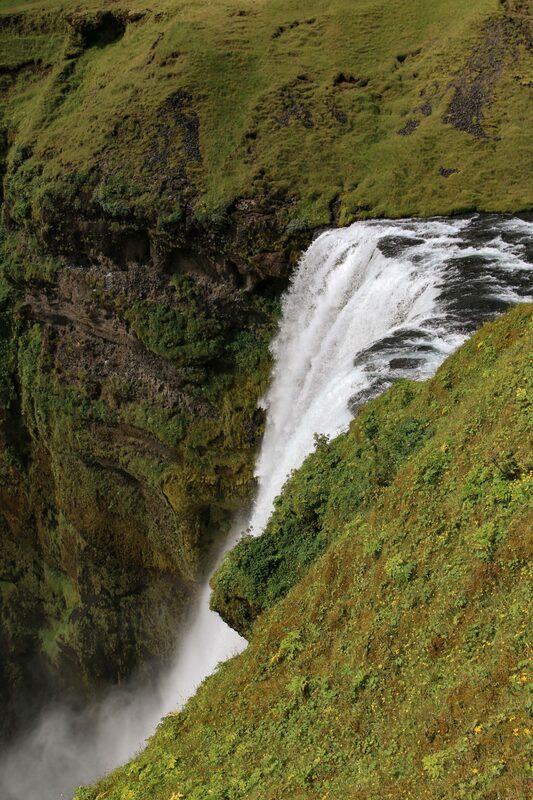 One of them is another waterfall called Skógafoss. I really liked the other falls we’ve seen before, but in the very moment I leave the car I fell in love with its beauty right away. 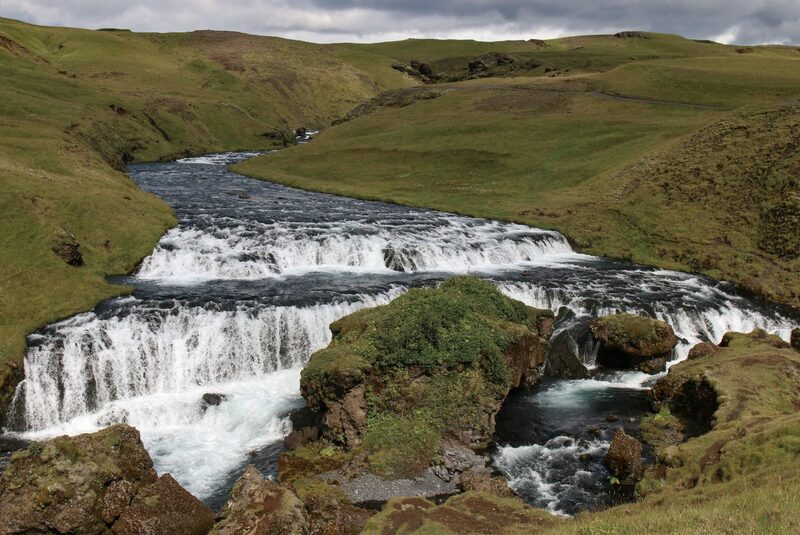 Nestled by green mountains, the river Skóga flows unhindered through the landscape. In two little cascades, the water already falls from rock edges, until it finally makes its way sixty meters down the cliff. I’m also fascinated how deep green the surrounding nature looks. The colors are so rich and beautiful, which must be ascribable to the quantities of water passing by. 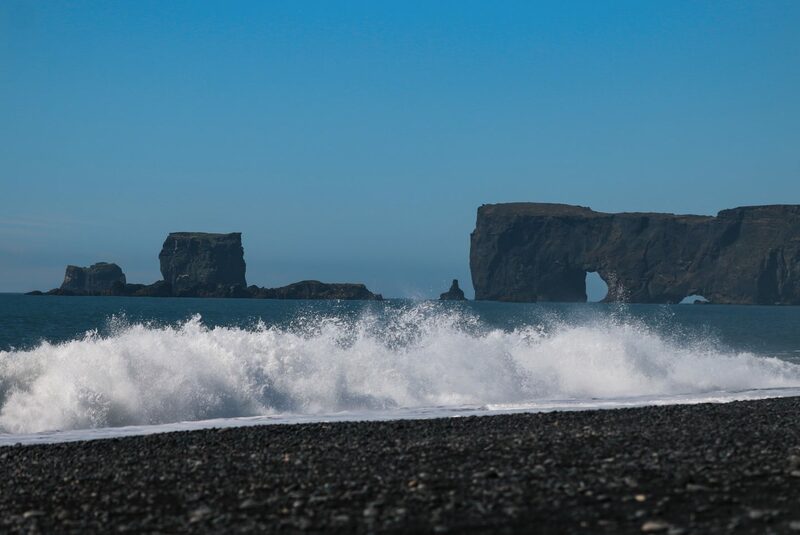 On our way back we pass by the black beach for a second time but determine to have another point of view upon the majestic cliffs. 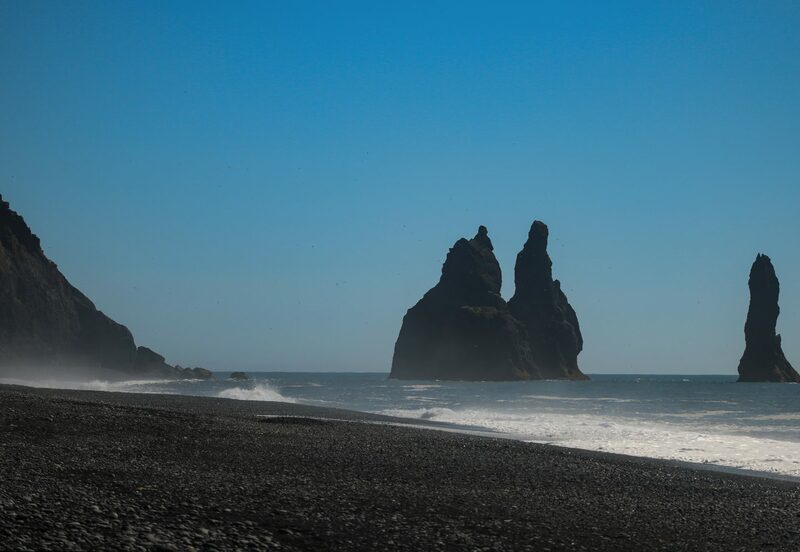 Just a few minutes away we find the beach Reynisfjara which is quite famous, but we decided to omit it in the first place because its super touristic. It’s of course impressive and amazingly beautiful especially the cliffs which are formed through octagonal basaltic rocks. Nonetheless the beach is also dangerous. You shouldn’t underestimate the power of these waves. The locals call these “sneaky waves”, as they can carry you away quite easily and it sadly happened a few times that people got caught by the waves! Fun fact: Some scenes of Game of Thrones were filmed here. 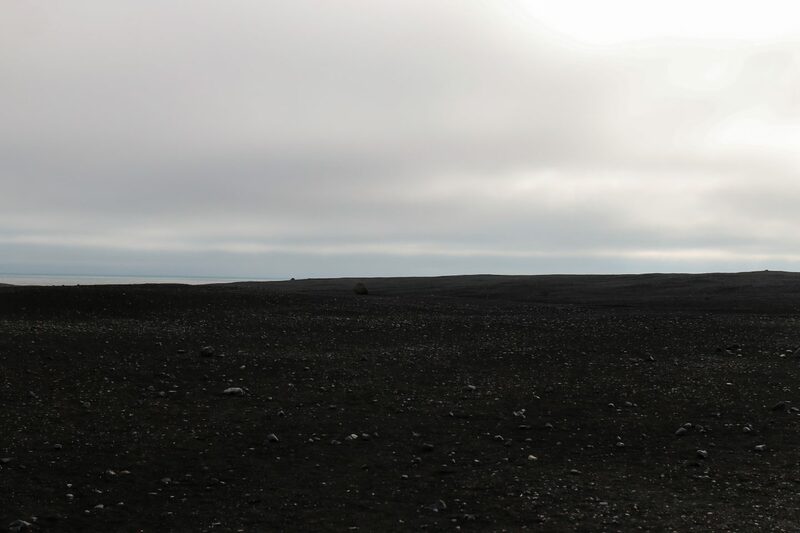 After reflecting our opportunities we make our way back to Vík camping where we stayed the other night. As Kai is still ill, we go grocery shopping (tea, bonbons and tempos) and spontaneously decide to cast a glance on the range of Icewear. This is the precious moment when we discover the power of hot patches. Never underestimate the power of a good heat patch. Despite the first night, this one was probably the warmest. The best thing about the patches: they keep you warm for about 12 hours, so you can enjoy the warmth also during daytime. This brought us to visit Icewear again and buy some more heat patches for about 8 € per patch – but it was totally worth it. We didn’t do much today, until we made the plan to drive more west in the direction of the Reykjanesfólkvangur national park. 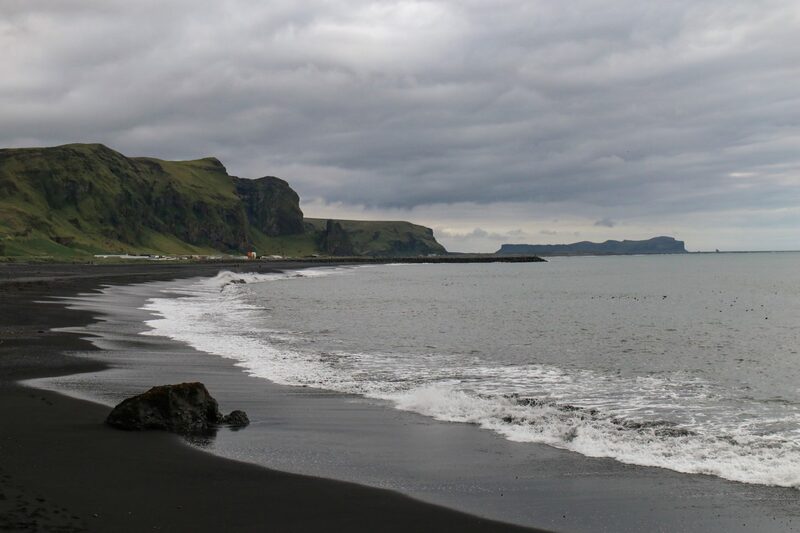 After a long drive, we take a short break and walk along the sea, which looks much different from Víks beach earlier that day. The sand is white and here are lots of white shells and crabs on the ground. The sun is shining again and I simply enjoy this very moment. After a while we continue our little journey and reach the campsite for the night. 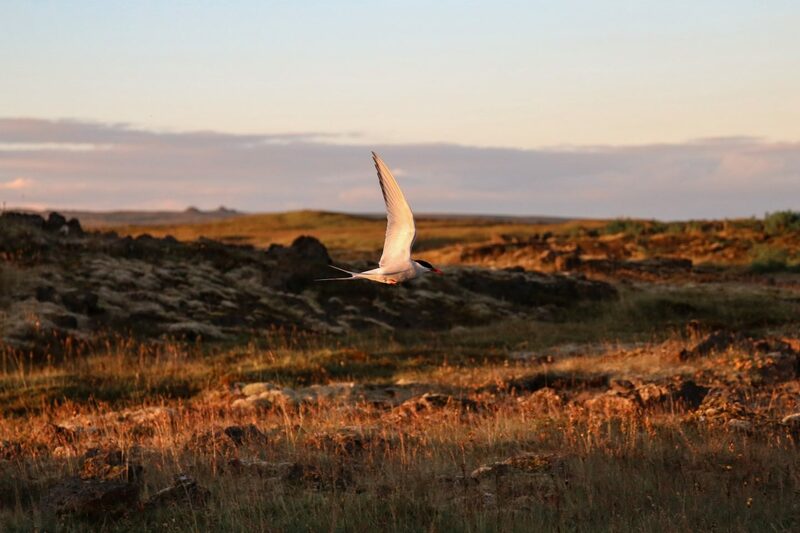 As we drive down the gravel road in our car we realize that there are lots of sea swallows flying around. The moment I leave the car to help Kai maneuver through the campsite, a few swallows dive upon me. 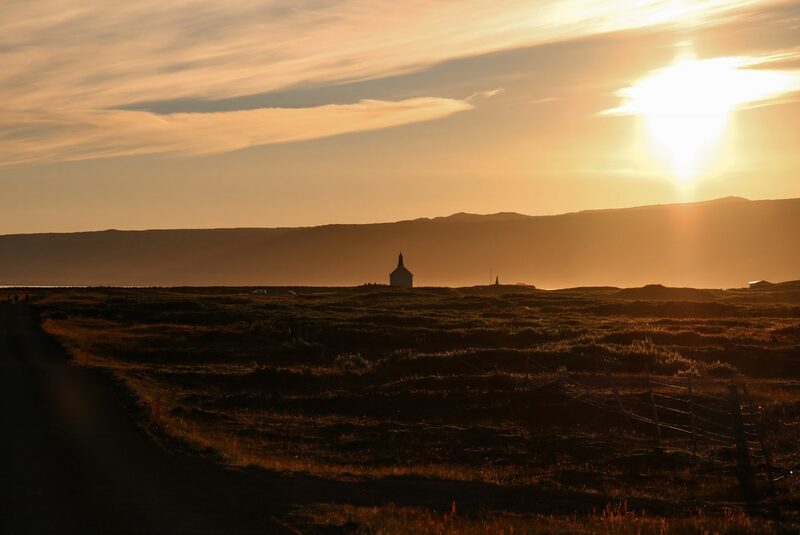 We park the car a bit further away from the swallow land and enjoy the most beautiful “sunset” over Iceland (there are hour lasting sunsets during Summer as it never gets night as we know it. The sky only gets dusky for a few hours). It’s the last day on the road for us and about time to explore the national park near by. I enter the park’s name in Google Maps and we follow the instructions which the kindly-speaking woman is telling us. It’s an exciting mountain pass and I’m super anxious (again). The dangerous and sharp curves and the height let me atrophy. We reach a little gravel road and there’s a big warning sign at the beginning of that road: Enter on your won risk. No road service during wintertime. Emergency services might take a while until they reach you. That’s it. 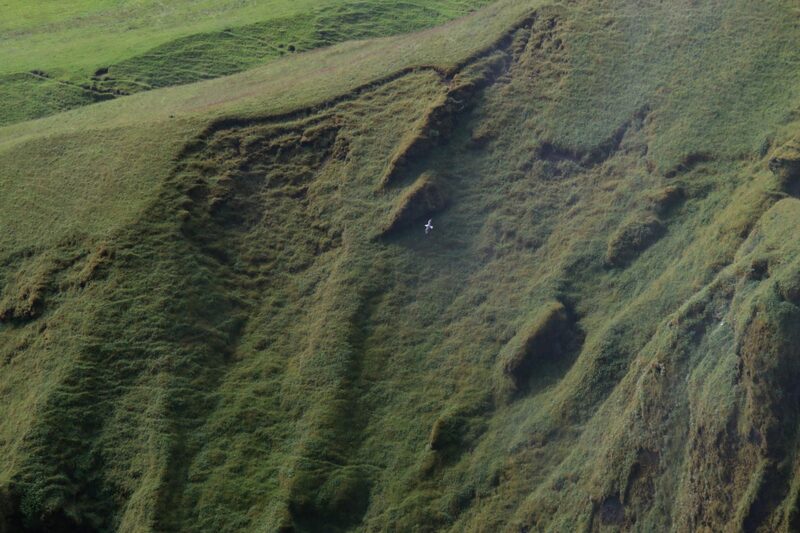 And I can’t believe that Google Maps says this is the way we need to take for the park. Another “normal” car drives towards us, which we interpret as a sign to also drive down that road. Do you guys know that song “Road to Nowhere”? The street get’s really uneven and also muddy, sometimes I’m not quite sure, if it was a good idea to drive even further…but of course there’s always the point where things start to get better. We finally enter a tarred road again! Time to explore this beautiful national park even more. Pointless, we drive here and there until we reach a beautiful big lake, where we just had to stop. Here are also other traces of civilization: Some crazy humans are taking a bath. At least they are screaming a bit, otherwise I would be worried how they manage to survive the cold water. The rock looks really strange here. We decide to do a little hike up the hill. The sand is red. 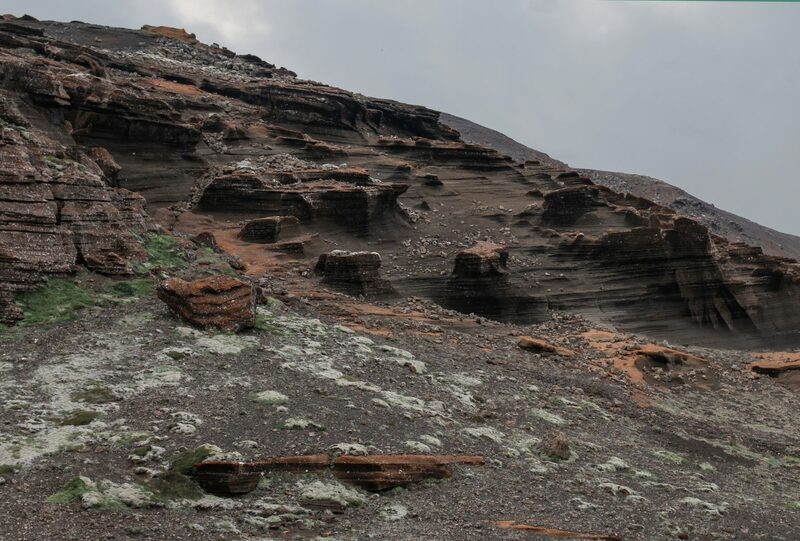 When a squall treks the hilly landscape, it whistles and creates a red sand cloud here and there. We sit down on the edge of a cliff. Some people have scratched their names in the rock: seems to be a popular bench for those who hike up here. It’s the most quite moment in my life. You always hear something: at home it’s the conduits, your neighbors, your electronic devices. When you leave the house you listen to birds, music other humans. There’s always some kind of noise. But here, on top of the world, I hear nothing at all. Not a single sand grain. It’s silent. Even when I was hiking in the German alps I heard more than now. It’s unbelievable. But I enjoy the silence. The only thing which breaks the absolute silence from time to time is the wind. The rock displays signs of the wind on it’s surface: there are some lines carved in the stone. After we a cup of tea, we make our way down. Back in the car, back to exploring. 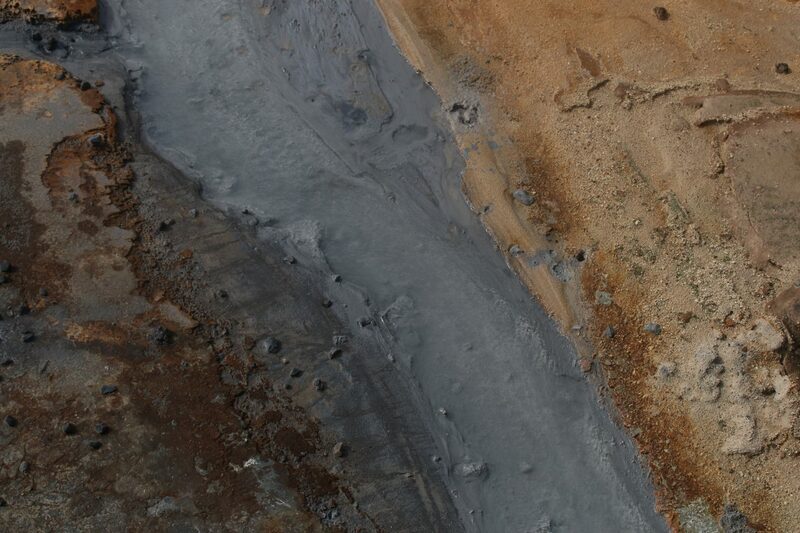 Krýsuvík is another geothermal area and what makes this one special are the sediments which make appearance in the most beautiful and surreal colors: Orange, red, silver, grey, yellow and blue. 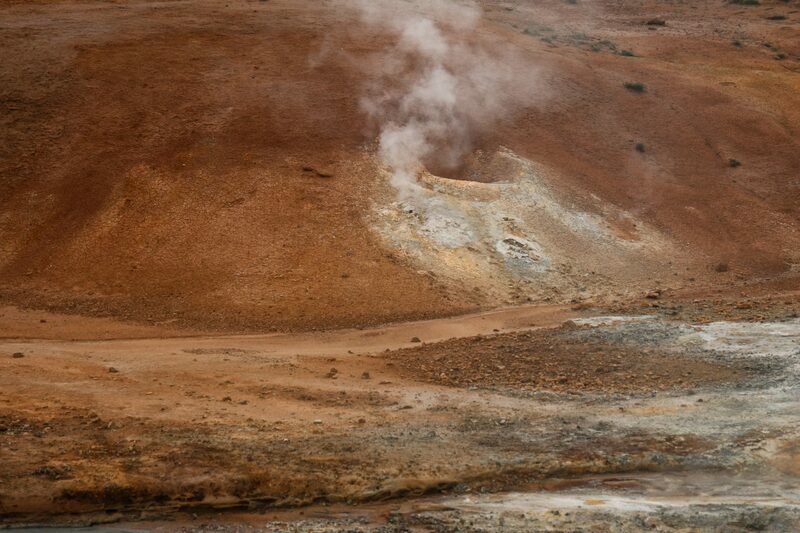 The whole ground in covered in this intense coloring and of course it also creates steam and bubbles. I feel like I’m no longer on Earth, instead I must have landed on Mars. 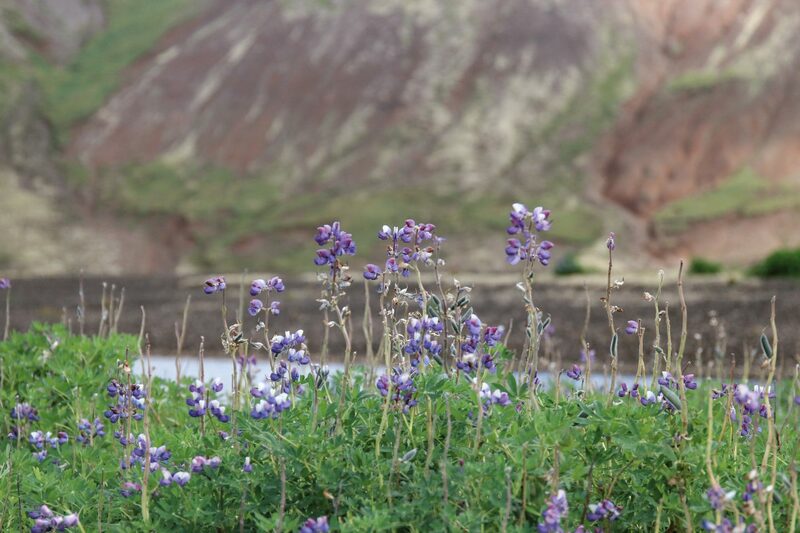 Although Krýsuvík is out-of-this-world beautiful to watch, the smell is the baddest. 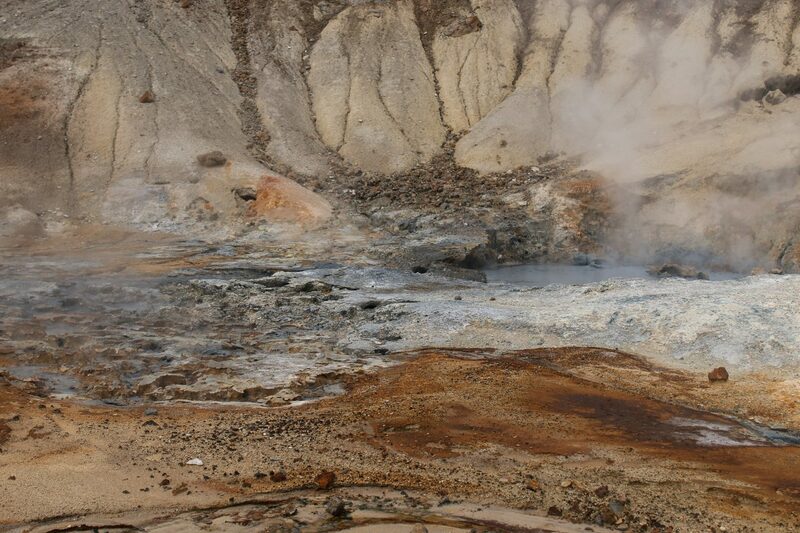 Sulphur occurs in large amounts and the resulting odor makes me think of bad eggs (urgh!). 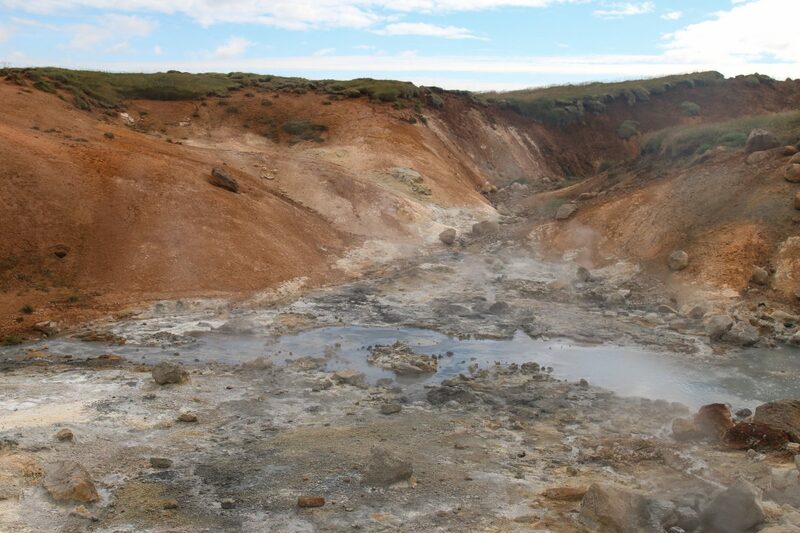 The geothermal area is much bigger than you would probably think at first glance. 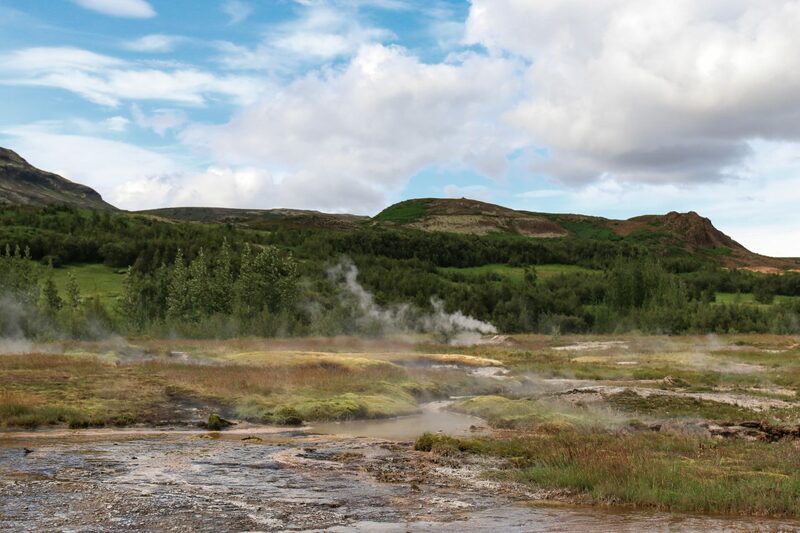 There is a lot going on in the valley, but you can also climb up a hill to see some more geothermal activities. Of course we made our way up there. 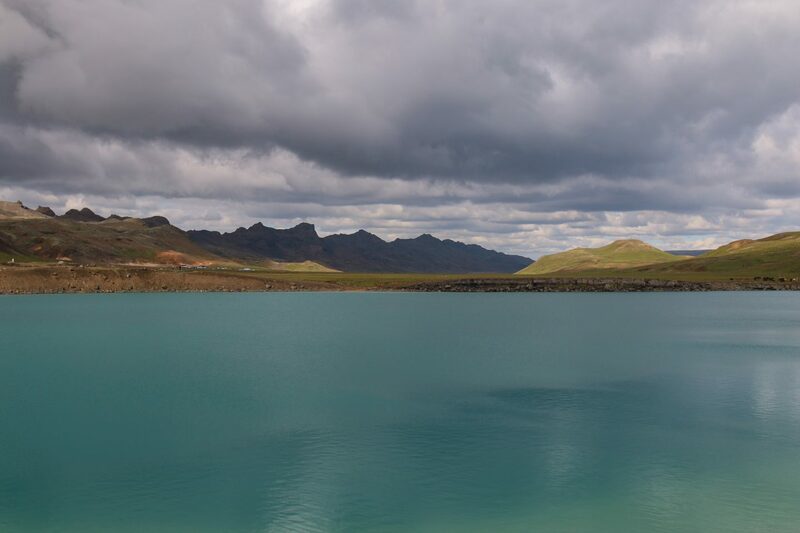 The view on top is amazing, we also spotted a beautiful super blue lake and I keep this place in mind so we can do a little stop there when we drive on. We are at the lake. The water is so incredibly blue, I can’t take it. I didn’t edit the photos in terms of saturation or anything, I only do what I always do: adjust the lights and shadows a bit. Although it looks amazing, we move on. 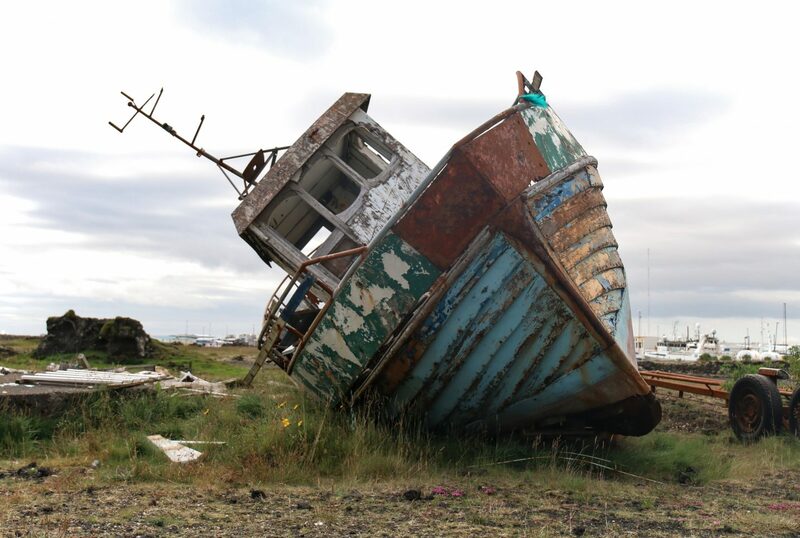 I wanted to see a shore in Grindavík where a lot of old shipwrecks lie stranded on the beach. It’s a super windy and also dangerous area for boats and ships. 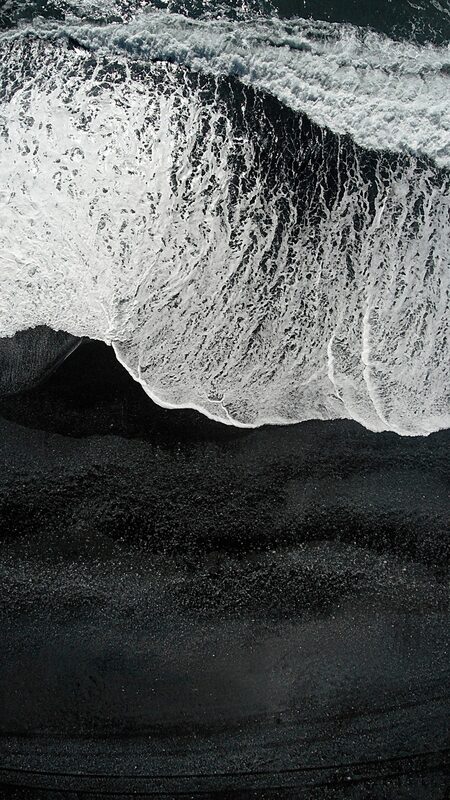 They all went through rough storms until they hit the cliffs and sink or burst. A little editorial later (see it here) we are on our way to the last stop: The church of Strandakirkja, which we have seen the evening before during the sunset hours. 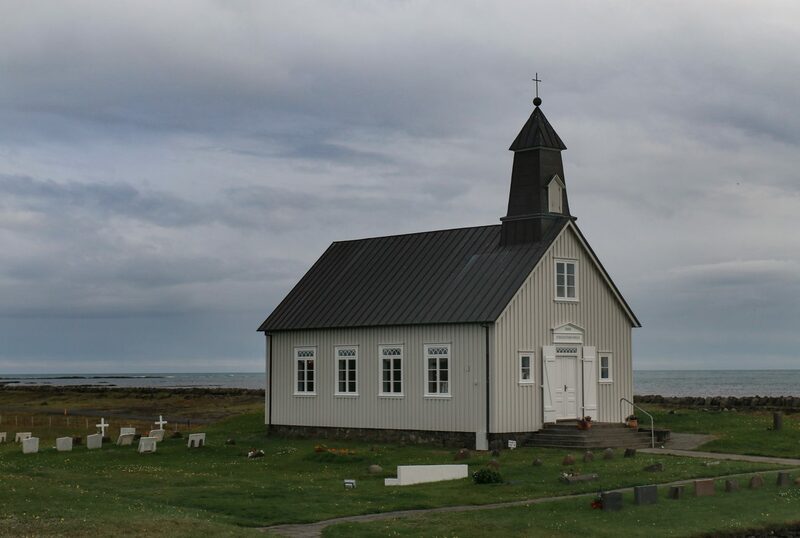 The church is wonderfully located directly by the sea and we enjoy some time strolling around here. 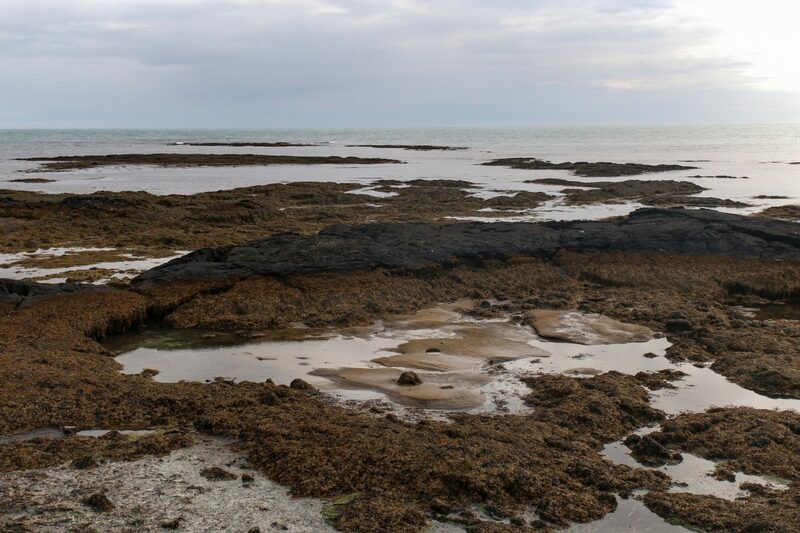 We also go down to the sea and enjoy some deep breaths of fresh sea air. After that we go back to our campsite from the night before. There’s a little kiosk here where some girls sell waffles. We both take one each and I’m really digging the taste after a week of “camping food” (although I did my best to make it as tasty as possible 😀 ). The last day is probably the most boring, but we had such exhausting, cold and adventurous days that it was about time to slow down a bit. 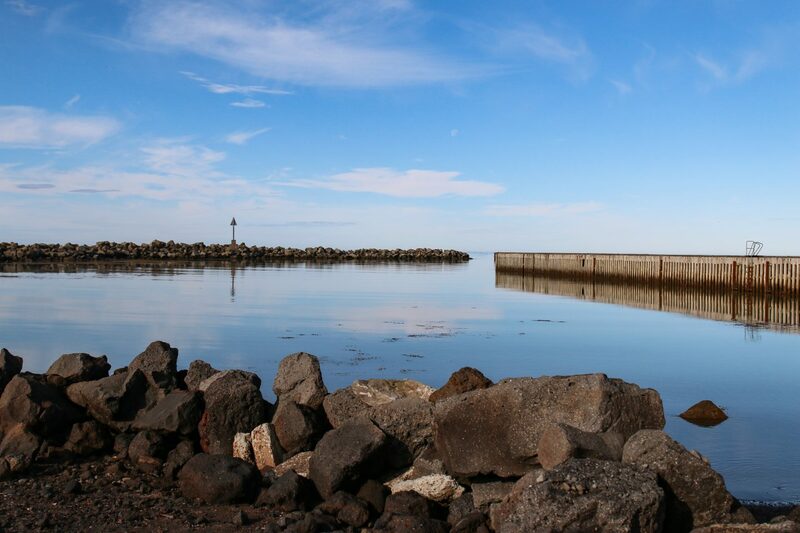 On that last day we spent some time in Reykjavik. First we had a super delish avocado toast in a little coffee shop and managed to charge our smartphones there. Afterwards we went to the Perlan museum, which was definitely worth a visit. The architecture of the old hot water tanks is beyond amazing and I really loved the café in the glass dome. Likewise, the exhibition itself is wonderful. 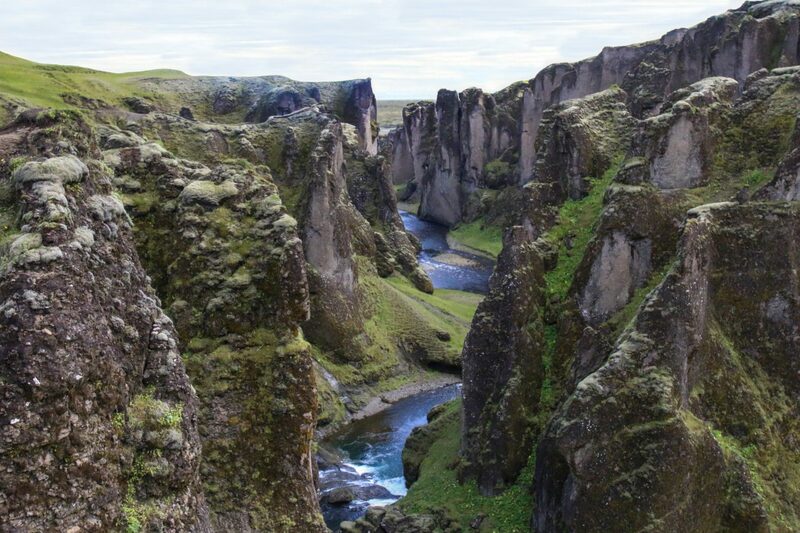 It’s super interactive and versatile, you can learn anything about Iceland, especially about their amazing nature. They even built an ice cave inside the building, which was super cold but we had so much fun exploring this place! About 7 p.m. we drive to our last campsite. We are only staying there for a few hours, until a shuttle bus brings us to the airport around 3 a.m. We decide that it would be the best to stay awake until then, so we cook a dinner, clean the van and pack our stuff. The last hours in our car: we are listening to trashy music and trying to fight the cold. At 2 a.m. we leave the car behind and walk to the pick-up location. Damn, this were cold hours spend outside. The moment the bus arrives to pick us up, I’m happy and sad at the same moment and I can’t wait to be back one day. In the morning of the 9th day we touch down in Frankfurt, where my grandparents live and wait to collect us. When we arrive at my grandparents house, I’m so ready for a hot cup of tea and a nice, long shower. In Germany it’s about 40 °C (104° F) but nonetheless I feel like I could need some warmth. The moment I take off my three pairs of socks is so soothing but also sad. We are back home. Time to create some new memories and to share the ones we collected during our adventure. I hope you enjoyed this super long post. 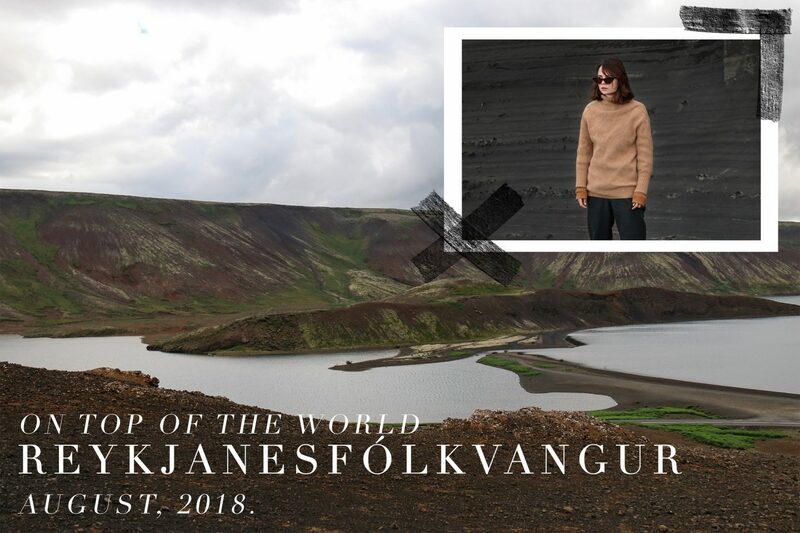 Have you ever been to Iceland? Do you plan to do so? wow, das sieht ja mega toll aus dort! Reisebericht, zum dem Flugzeug will ich dann auch. Okay WOW! Eine unglaublich schöne Landschaft! Obwohl das Klima dort ja gar nicht sooooo meins ist, steht Island definitiv auch noch auf meiner „MUST TRAVEL LIST“! 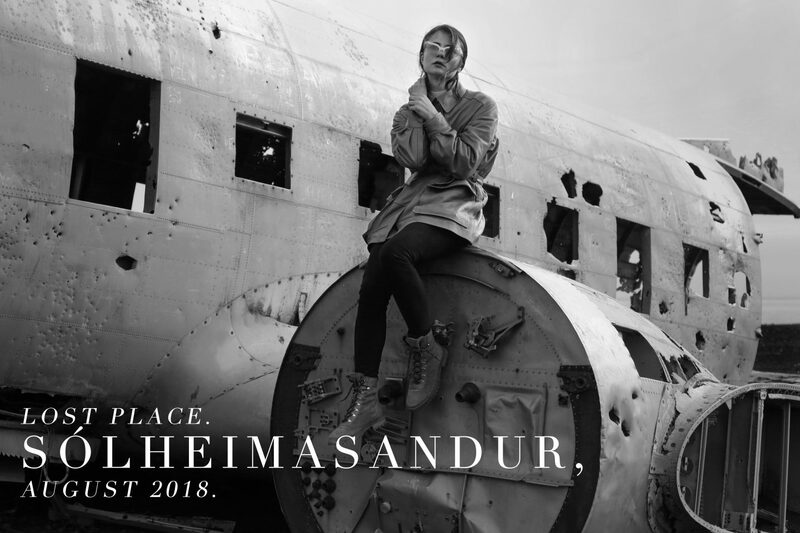 Wirklich ein absoluter Traum und perfekt für Shootings!